Nearly every day in my practice, a patient with diabetes asks me whether he or she should switch from multiple daily insulin injections to an insulin pump. I often have a discussion with patients about whether or not they should be using a CGM (continuous glucose monitor) to help monitor blood glucose instead of just using SMBG (self-monitoring of blood glucose). As an endocrinologist, it is very important to be able to advise patients about specifically what these new technologies have to offer them. Do they decrease mortality? Do they decrease long-term diabetes complications? Do they improve glycemic control? Do they improve quality of life for patients? Do they lower costs? All new medical technologies need to undergo a rigorous evaluation and testing with these types of questions in mind. This is critical not just so that I can be honest and helpful to my patients, but also from the overall perspective of the healthcare system. What types of studies did they include in their meta-analysis? Overall, they assessed the strength of evidence as relatively weak. In children and adolescents, CSII showed no difference in clinical outcomes from MDI. CSII was better in terms of quality-of-life. In adults with type 1 diabetes, CSII led to more symptomatic hypoglycemia, but better hemoglobin A1c and quality-of-life. 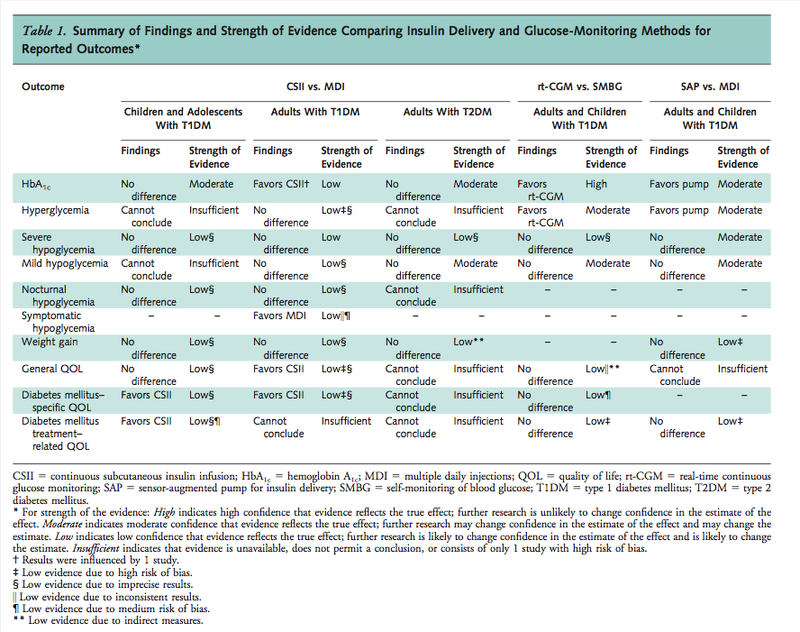 There were no differences between CSII and MDI in adults with type 2 diabetes. CGM, whether with an insulin pump or not, led to a benefit in glycemic control without any difference in hypoglycemia. Meta analyses can always suffer from publication bias. That is, studies are much more likely to be published if they show positive results. So it is possible that studies have been done that generated results that would have shown no difference between the two methods being studied, but these may never have been published and thus cannot be included in the meta-analysis. These studies all had durations of 12-52 weeks. There were no studies reporting on long-term outcomes like micro or macrovascular disease. 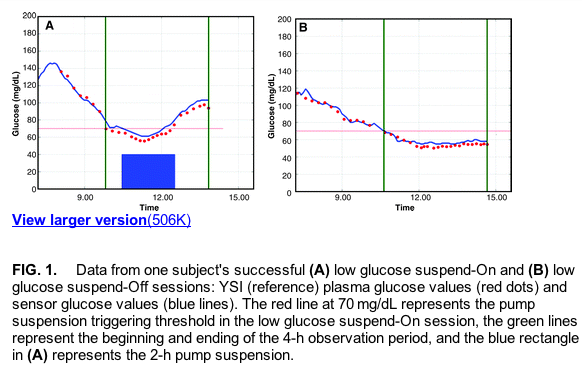 According to this meta-analysis, CGMs did improve glycemic control. Insulin pumps did not appear to have a significant effect on clinical outcomes, but did positively effect quality of life. Remember that the studies included were all between 12 and 52 weeks, so one major limitation is that any longer-term effects would not be teased out. While some may discount the quality of life improvements seen with the pump as being less important than clinical outcomes, I caution people from doing so. In a condition as omnipresent as diabetes, maintaining good quality of life for the patient is critical and a very important goal. In the end, the decision about whether or not to use one of these devices comes down to a conversation with the patient and their family, based on their personal preferences and what each device might offer them in terms of benefits and harms. This meta-analysis adds some more information to that conversation. Finally, this meta-analysis shows that we simply need more data to study so that more concrete conclusions can be drawn. Posted on October 10, 2012 December 11, 2013 Categories Continuous Glucose Monitoring, Diabetes Technology, Glucometers, Insulin pumps, Medical literature reviewsTags Annals of Internal Medicine, CGM, Comparative Effectiveness, Diabetes mellitus, insulin pump3 Comments on Do insulin pumps and continuous glucose monitors actually improve outcomes?